When you are experiencing motor failure and are unsure about how to proceed, let us try to help before you even give us a call. Consult the chart below to easily diagnose many of the most common motor issues and find out how to move forward. 1. Check feed connections to control system and from control system to motor. 2. Check voltage supply and ascertain that voltage remains within 10 percent of the rated voltage shown on the motor nameplate. 3. Compare connections with the wiring diagram on the motor nameplate. 5. Try to start motor under no-load conditions. If it starts, there may be an overload condition or a blocking of the starting mechanism. Reduce load to rated load level and increase torque. 6. Brushes may be worn, dirty, or incorrectly fitted. 1. Vibrations can be eliminated by balancing rotor. If load is coupled directly to motor shaft, the load can be unbalanced. 2. Shaft can be bent, check rotor balance and eccentricity. 3. Check motor alignment with machine running. 4. Check shaft for warping or bearing wear. 5. Dismantle motor and remove dirt or dust with jet of dry air. 6. Dismantle motor and clean. Remove trash or debris from motor vicinity. 7. Tighten all foundation studs. If necessary, realign motor. 8. Check lubrication. Replace bearing if noise is excessive and continuous. 1. Remove grease bleeder plug and run motor until excess grease is expelled. 3. Have shaft straightened and check rotor balance. 4. Replace bearings before they damage shaft. 5. Check end shields for close fit around circumference and tightness. 6. Add grease to bearing. 8. Flush out housings and re-lubricate. 1. Balance rotor statically and dynamically. 2. If bearing rings are in perfect condition, clean and re-lubricate the bearing, otherwise, replace bearing. 3. Before altering shaft or housing dimensions, it is advisable to ascertain that bearing dimensions correspond to manufacturer's specification. 4. Take bearing apart and clean. Reassemble only if rotating and support surfaces are unharmed. 1. Clean and dry motor; inspect air vents and windings periodically. 2. Check application, measuring voltage and current under normal running conditions. 3. Compare values on motor nameplate with those of mains supply. Also check voltage at motor terminals under full load. 4. 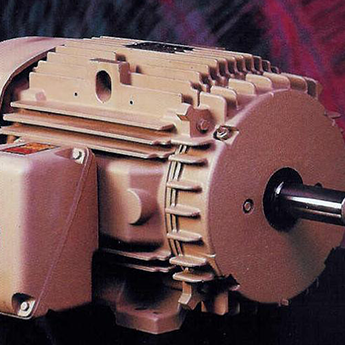 Exchange motor for another that meets needs. 5. Check bearing wear and shaft curvature. 6. Check for unbalanced voltages or operation under single-phase condition.